Fourth Grade Nothing: 1980s Klik Klaks or Clackers or Kabangers! Great Balls of Fun! We loved them!! They hurt, but we loved them. Us "70's" kids were used to toys that could kill you. Today's toys are wussy toys!! I didn't remember them until I watched the video. It all came back to me then: my daughters doing it for hours. Interesting....I have never heard of this before! Yes, another deadly toy from my childhood. You could easily bash your head trying to get these to work properly. Later they put a plastic handle on them. I remember then, but here in the UK they received some bad publicity because they could shatter and pieces of plastic could fly into your eyes. That was enough to make sure my mother never allowed us to have any. I certainly do remember them. Thank goodness the hurt does go away, eventually. Ahhh, the memories! 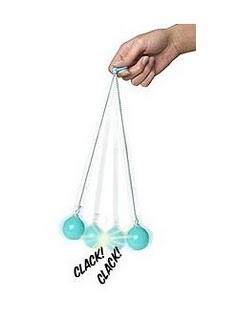 We called them CLACKERS back in the 70's...and if you were a girl, you had 'em! Mine were red. They were so much fun....even when they bruised our wrists all to hell. (One girl I knew broke her wrist with these things). Crazy, yeah. I was an odd child and loved that one too. I wouldn't mind one right now. There's something weirdly addicting about that thing. Really loved those things too. I think because they served as great karate weapons. It was totally a ninja toy if you wanted them to be. I've actually posted about this numerous and have even tried to track one down in the original packaging. Give kids lucite balls to swing. Brilliant! BTW...made you blog of the day. I used to have something like that when I was younger. It was fun at first, but the first time I hit myself with them I was done. I had very low patience for my own stupidity. Awesome! They were genius! Until.. brats like us started throwing them at each other! They were selling them this summer at the local fair. I have been trying to find these for years I love kabangers I guess I am odd too...lol where can I buy a pair??? That is one of so many reasons I want to re-live the 70s. I am obsessed with the idea! One of best movies to watch and re-live the 70s is Dazed and Confused! Not a great plot to the movies but the next best thing to re-living the 70s. BUT for the clackers... that was a great novelty of that time! Like Super Elastic Bubble Plastic and cinnamon toothpicks!